Day 2 of the Grade 1 here in Pornichet was similar to the first with gentle breezes in the morning building to a choppy, strong sea breeze in the afternoon. We had all the hard work ahead of us after an average start yesterday. Luckily with the format the way it is, it meant that if you didn’t finish in the top 4 after the round robin you had a second chance to race in the repechage and win to advance into the quarter finals. As a top four finish was now impossible for us it meant we just had to focus on fixing our boat speed problem from yesterday so that when we got to the races that counted we could perform. After the round robin we finished 8th, meaning that we had to race 9th placed Mad Ebler (World Ranked 16th) in the best of 3 series. The series went all the way after losing the first race and a considerable way behind, staring down the barrel on the last downwind of race 2, things looked grim. However we weren’t ready to give up just yet. We had been practicing all week “goose winging” the kite downwind, which can sometimes be faster than the conventional method if done properly. So the call went out to “goose wing” and we nailed it smoking like a freight train right up to him and passing him just on the finish line. This put us on 1-1 and finally the tide felt like it might be turning for the boys. The final race was a tight one all the way around with a red flag penalty going against us but we managed to just keep ahead to sneak into the top 8. Things still didn’t feel like they were gelling for us today but it was definitely an improvement. Hopefully tomorrow with the acid on we can step it up a notch and keep progressing in the event. One thing is for sure we will keep battling for the victory. With four remaining matches in the round robin, we were looking to continue the form of the previous day. Once again though, we had a slow start to the day and went down in the first race of the day to Michele Perris in a very light but building sea breeze. We then met Damien Iehl in a tight race where he was given two penalties for causing contact, the second handing us a comfortable lead to take the win. 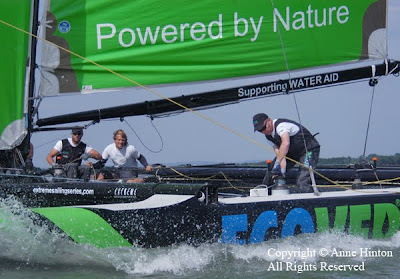 The match of the day though was against world no 4 and current leader of the World Match Racing tour, Mathieu Richard. We were given a penalty in the final seconds of the prestart and managed to keep it close enough to get inside, and take the lead at the bottom mark. This didn’t get rid of our outstanding penalty though so we had to engage Mathieu on the final run. We managed to overlap him to windward and luffed, clearing our turn and bore away to hoist. We were now just behind and traded gybes the rest of the run. Mathieu was able to hold us off though and crossed the line only inches in front. At the end of the round robin our scorecard read 8-3, now we move into the quarter finals with a clean sheet. We will find out who our opponent is tomorrow morning. After having the afternoon off today we will be fresh and ready to come out firing. Black Sheep Racing is Brad Farrand, Nicolas Derberque, Reuben Corbett and Tom Bentham. 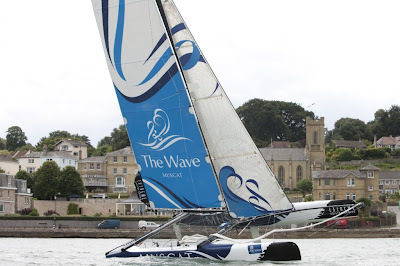 The Wave, Muscat, training off Cowes. Image copyright Mark Lloyd/LLoyd Images/Oman Sail. Oman Sail will be out in force for Cowes Week with their two Extreme 40’s racing, their 105ft Arabian 100 trimaran making a dash over from France and an Oman Experience to enjoy at the Extreme Race Village where you can win a fifth man spot on an Extreme 40 and a holiday to Oman. 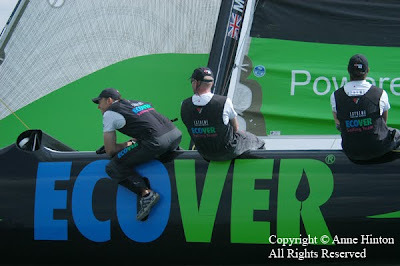 Back again in Cowes are the two Oman Sail Extreme 40’s, Masirah and The Wave, Muscat. The duo finished second and third in the first event in France and will be looking to improve their positions over the six days of racing in round two of the European Extreme Sailing Series. A total of nine teams have signed up to compete in the Extreme Sailing Series in Cowes. The Wave, Muscat’s crew remains unchanged for the week, and Masirah welcomes Fred Le Maistre (FRA), former bowman on Extreme 40 Groupama, for the event, in place of America’s Cup sailor David ‘Freddie’ Carr, who is sailing with the British America’s Cup team during the week. Volvo Ocean Race winning French yachtsman Sidney Gavignet will be making the crossing from Lorient, France to Cowes onboard Majan Oman Air, the giant 105ft Arabian 100 trimaran.Sidney is preparing to compete in the prestigious Route du Rhum, the single-handed transatlantic 4,000-mile race starting in Loriet, France in October. Majan will be displaying the colours of her newly announced sponsor, Oman Air. The sponsorship aligns Oman Air, Oman Sail and the Ministry of Tourism’s marketing strategies in Europe, with all three taking an active role in the Route du Rhum project and this will mark the first time the new branding has been revealed in public. During the week, spectators can get a real flavour of Oman for themselves, learn more about the Oman Sail project and win some amazing prizes in the Oman Experience, located in the Extreme Racing Village. Oman Sail is an exciting initiative whose aim is to rekindle Oman's long and glorious maritime heritage. Khamis Al Anbouri, who sails on The Wave, Muscat, and recently won the Extreme 40 class in the J.P.Morgan Asset Management Round the Island Race, explains why Cowes Week is so significant to Oman Sail. “Cowes is a really important event, not just for the Extreme 40’s but for Oman Sail. Majan being here adds a really exciting element to the week and it will be brilliant to reveal its branding at such a prestigious event. Sailing in Cowes is always a great experience and to have so many members of our team here makes it really special”. Joining Khamis is fellow Omani National Squad member Nasser Al Mashari, fresh from finishing the Tour de France à la Voile, where he finished an impressive fifth place onboard Oman Sail’s Renaissance. Nasser was part of the winning Masirah team in the Extreme Asian Series. 10 flights were held on Day 2. 4 skippers qualified - Mathieu Richard, Eugeniy Neugodnikov, Philippe Presti and Reuben Corbett (who has gone through to the quaterfinals, thanks to defeating Damien Iehl). Iehl and Pierre Antoine Morvan will go to the repechages in search of a place in the quarterfinals. Corbett has 10 wins from 11 races - losing only to Neugodnikov. Winds averaging 14 knots provided ideal conditions for racing. Richard defeated Iehl in their much anticipated match after penalties and very close racing. 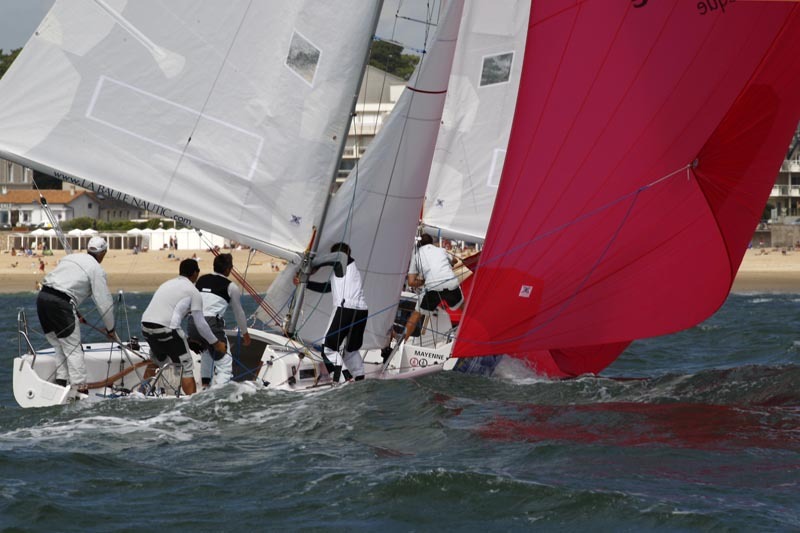 It is your first time at the Internationaux de France de Match Racing at Pornichet. How do you find it? It's the first year that we have done regattas in Europe and we have done 7 events in 2 months. We are constantly racing and we are progressing. This is what enables us to compete at this level. We are constantly competing. In the case of the Internationaux de Pornichet, we were invited at the last minute as we were not in the best 15 in the world. Our victory at the Match Racing Grade 1 in Russia enabled us to come here. And the competition does not make us afraid. Whether they are number one or 30th in the world makes no difference. We maintain the same approach, and that serves well. It's the same as the Grade 1 in Russia. We were invited late and we, equally, surprised everyone in winning this significant regatta. We also defeated Damien Iehl in the semi-finals. We approach all the races in the same manner, we approach the matches without asking questions or thinking to lose to particular opponents. Our duel with Mathieu Richard today was truly great, there was a lot of combat. What are your objectives for the coming days at this event? To stay relaxed! We won't change anything, and we will continue to approach match after match in the same way. Our aim is to go as far as possible. The podium would bring us great pleasure. Black Sheep Racing is: Reuben Corbett, Thomas Bentham, Bradley Farrand, Nicolas Deberque. Cette deuxième journée de Round Robin s’est déroulée dans des conditions météos changeantes permettant d’envoyer 10 flights pour terminer le Round Robin. 4 skippers se sont qualifiés dès 16H30 dont sans surprise Mathieu Richard, Eugeniy Neugodnikov et Philippe Presti. En revanche, l’outsider Reuben Corbett a surpris les français en passant directement les qualifications grâce à sa victoire contre Damien Iehl. Ce dernier et Pierre Antoine Morvan ont dû aller aux repêchages pour avoir leur place pour les ¼ de finale. Sur ces 2 jours de Round Robin, le néozélandais Reuben Corbett a battu Philippe Presti, Damien Iehl et Pierre Antoine Morvan. Seul Mathieu Richard réussi à lui faire face et continue ainsi sur sa lancée, avec 10 victoires sur 11 inscrites au tableau. Chapeau ! Le vent s’est établi en début d’après midi avec 14 nœuds de moyenne, offrant des conditions excellentes et très agréables pour les équipages. Le soleil pourtant capricieux n’a pas dissuadé les visiteurs de venir en nombre sur le village et dans les gradins. Le duel Richard / Iehl fût très suivi et a tenu toutes ses promesses : des pénalités, des dépassements, des frayeurs et la victoire sur le fil de Mathieu Richard, leader actuel du World Tour. Ainsi, c’est carton plein pour la France pour les ¼ de finale. Les choses sérieuses vont commencer dès demain matin 10h avec des duels grandioses assurés ! Zoom sur l’outsider Reuben Corbett qui surprend tout le monde et peut prétendre au podium. Ø C’est votre première participation aux Internationaux de France à Pornichet, comment appréhendez-vous cette épreuve ? Ø Quels sont vos objectifs pour les prochains jours de cette épreuve ? « Rester relax ! On ne change rien, on continue match après match dans le même état d’esprit. Notre but est d’aller le plus loin possible. Le podium bien sûr nous plairait beaucoup ». Composition de l’équipage : Reuben Corbett, Thomas Bentham, Bradley Farrand, Nicolas Deberque. The first day of the Internationauy de France de Match Racing commenced in optimal conditions. Light breezes in the morning gave way to moderate west-southwest winds in the afternoon. The 12 teams were able to complete 10 flights during the day. Results after the first day are: 1. Mathieu Richard (FRA), 2= Philippe Presti (FRA) and Reuben Corbett (NZL), 4. Eugeiny Neugodnikov (RUS), 5. Damien Iehl (FRA). Michele Perris (MON), as in Slovenia, has Adam Minoprio (NZL) on his crew. The crew is composed of Michele Perris, Adam Minoprio (NZL), Pierluigi de Felice (ITA - a national umpire in NZ) and David Swete (NZL - from Minoprio's BlackMatch Racing team). After nearly a month an a half off in the Waka Racing Calendar we’re back together today with the start of the Grade 1 Internationaux de France. The event is being held in four man J80 yachts in the town of Pornichet, France. Unfortunately for the boys the rust showed having a pretty average start to the regatta, finishing the first day with a 2 wins/5 losses scoreline. Today we struggled with boat speed in the choppy 15 – 18 knot conditions and were unable to address the problem before the day was out. This was very frustrating as the team was in strong positions off the start line against Philipe Presti, Rueben Corbett, and Pierre-Antoine Morvan but simply couldn’t foot it for pace. Luckily for us the regatta is far from over and by no means have we given up. An intense debrief followed the days racing and tomorrow we are confidient we can turn the situation around. Black Sheep Racing are back to business after a short break from sailing and each other, since our last event in Sweden. In these two weeks new world rankings have come out and we have moved up from 33rd to 25th. We assembled in Lorient, France on Monday 26th for some training against local PAM on the two days prior to the regatta, which is 2 hours down the road from Pornichet. We opened the regatta with a disappointing loss to Eugeniy. We had a slim lead near the top mark but could not cross so tacked on to starboard, forward and to leeward. We then gave him the lead by luffing too late to close the door at the top mark and he was able to sneak around inside us. This gave him enough to hold us off for the rest of the race. We then hit the next six races with form, getting solid starts in all bar one race and built on them with good speed to win them all. The most exciting of these matches was against our training partner PAM, who led us off the line. We had no need to push the point as he had been given a penalty in the prestart so our game was to keep it close enough so he couldn’t complete his penalty turn. After a lap of cat and mouse we rounded the top mark for the final run overlapped with PAM to leeward. PAM luffed aggressively forcing a red flag penalty on us meaning we must complete it immediately. We did just that then put the hammer down to rapidly haul him in so that he couldn’t complete his penalty and remain winning. PAM realised this so attempted to gain another penalty on us but we caught him off guard dropping his shoot so we held ours and rolled him to snap victory. Our scorecard reads 6-1 but there is a long way to go. Today they completed ten of eighteen flights for the round robin so tomorrow should see the race committee conclude the round robin and start the repecharge. Black Sheep would like to thank the Royal New Zealand Yacht Squadron, friends and family for their generous support. Thank you! ECOVER Extreme 40. Image copyright Anne Hinton, all rights reserved. ECOVER on the wind. Image copyright Anne Hinton, all rights reserved. ECOVER: powered by nature. Image copyright Anne Hinton, all rights reserved. ECOVER crew in action. Image copyright Anne Hinton, all rights reserved. ETNZer Andrew McLean and Mike Golding on board the X40 ECOVER. Image copyright Anne Hinton, all rights reserved. Leigh Macmillan (aka "Happy of the X40s") and Will Howden on the X40 ECOVER. Image copyright Anne Hinton, all rights reserved. 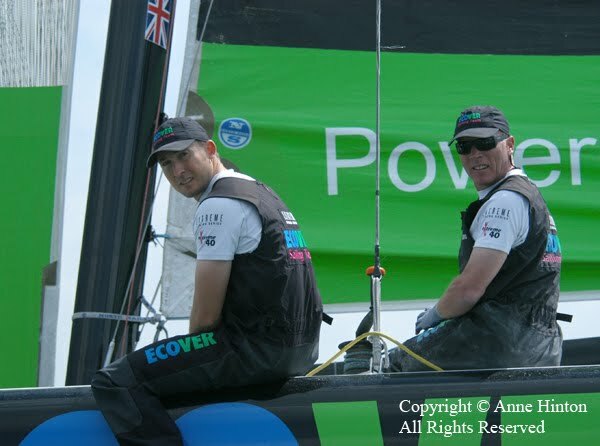 Leigh Macmillan driving and Will Howden crewing: former Olympic Tornado sailing partners at the back of ECOVER's X40. Image copyright Anne Hinton, all rights reserved. ECOVER Sailing Team: left to right - Andrew McLean, Matt Adams, Will Howden, Leigh Macmillan and Mike Golding. Image copyright Anne Hinton, all rights reserved. 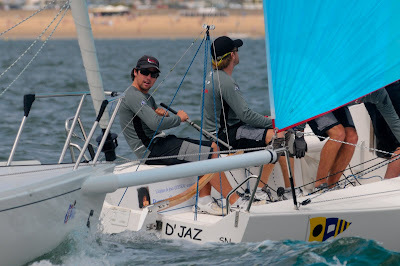 TEAMORIGIN racing with Jaguar - for a summer of sailing. Supplied image. TEAMORIGIN, the British America’s Cup sailing team, created by Sir Keith Mills with the single purpose of winning the America’s Cup for Great Britain is joined by Jaguar for a summer of sailing activities. 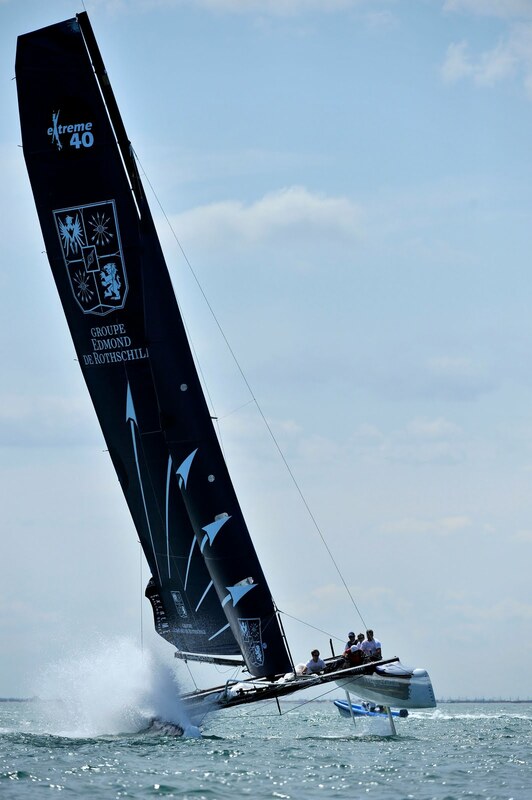 The first event that will see ‘TEAMORIGIN racing with Jaguar’ is during Cowes Week this August, when they will face BMW ORACLE Racing (the current holder of the America’s Cup) in the 1851 Cup event. This new partnership is part of Jaguar’s commitment to the best of British sport under the umbrella of the Jaguar Academy of Sport, which aims to recognise, celebrate and inspire the very best of British sporting talent and success. The partnership is further strengthened by the shared commitment of both organisations to strive for improved environmental performance. 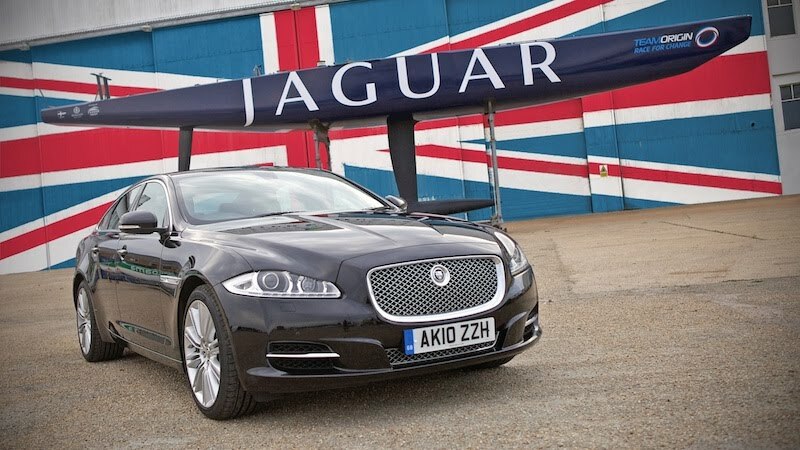 This is highlighted through TEAMORIGIN’s ‘Race for Change’ strategy, and Jaguar’s advanced Lightweight Aluminium technology, which resulted in the recent win for the new XJ of a Green Award from What Car? magazine. TEAMORIGIN’s newly branded livery will appear during Cowes Week (racing takes place between Tuesday 3rd and Friday 6th August) and will feature striking Jaguar branding on both the hull and sails. The spinnaker will feature a Jaguar leaper in Union Jack Motif, the symbol of the Jaguar Academy of Sport. Denise Lewis, Patron of the Jaguar Academy of Sport, commented: "As a Patron of the Jaguar Academy of Sport I was excited to learn about another exciting venture by Jaguar, which is continuing its efforts to support the best of British sport. Jaguar is building on the Jaguar Academy of Sport and really showing its commitment to the success of British sporting athletes. I am looking forward to following the racing during Cowes week, Ben Ainslie and I were together at the Sydney Olympic games, where we both won gold, and I want to wish him and the team all the best for the race and look forward to hearing the result of the 1851 Cup event." 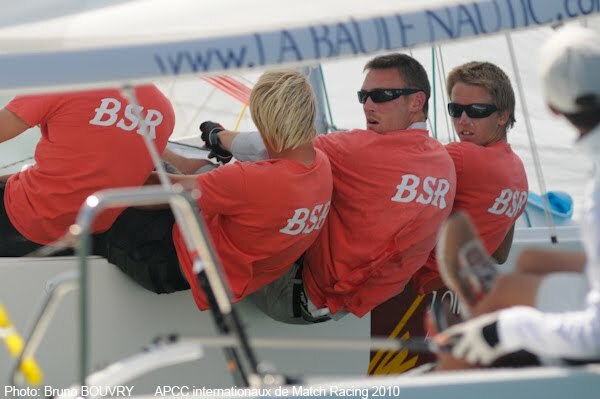 Round robin racing has commenced at the Internationaux de France de Match Racing 2010 in Pornichet in moderate west to southwest winds, with Mathieu Richard topping the scoreboard on 4 wins and no losses so far. The top eight from round robin racing go through to the quaterfinals. Extreme 40s in action at round one of the 2010 Extreme Sailing Series. Image copyright Vincent Curutchet/DPPI/OC Events. With just two days to go before the start of the UK round of the 2010 Extreme Sailing Series at Cowes Week, Official Timekeeper, OMEGA, has announced it will present a Seamaster Planet Ocean Watch to the winning skipper: an added incentive to the nine teams battling it out on the Solent from 31 August – 5 July. OMEGA has been the official timekeeper of the Extreme Sailing Series since its inception in 2007. The Seamaster Planet Ocean, made famous by Daniel Craig in the James Bond movie, Quantum of Solace, is water resistant to 600m, with a 45.5mm and a stainless steel bracelet. The perfect accessory for a professional sailor! 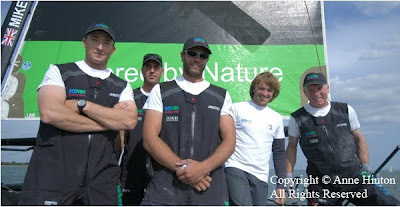 The regular eight boat fleet entered into the 2010 circuit has been augmented by top French sailor Roland Jourdain, who has joined the UK event with his team Veolia Environnement. Jourdain, a two times IMOCA World Champion, hasn’t raced on multihulls since he won the Formula 40 World Championship in 1989, the boat made famous by another James Bond actor, Pierce Brosnan, in the Thomas Crowne Affair. Groupama 40 from ECOVER. Image copyright Vincent Curutchet/DPPI/OC Events. Friday 30 July is a Media Day opening at 1pm with a press conference before up to three informal races in the afternoon for the gathered national and international media. Official, point-scoring racing commences on Saturday 31 July. Team GAC Pindar's Extreme 40. Image copyright Vincent Curutchet/ DPPI/ OC Events. Team GAC Pindar will join a total of nine world class entries for Round Two of the Extreme Sailing Series Europe during Cowes Week, from July 31-August 5. The British team, skippered by Australian all round yachtsman, Nick Moloney, will be looking to climb the standings as it competes in the second of five events on the 2010 calendar. The fast-paced fleet racing will take place over two race courses - a longer course in the mornings, which is set to test the speed of the exciting 40 foot catamarans, followed by a shorter, more spectator friendly course, just off the race village at Egypt Point, each afternoon. In keeping with the excitement on the water, race organisers Offshore Challenges, will this week be introducing a new form of onshore entertainment, called ‘Sailing Rocks’. Featuring island-based DJs, selected by BBC Radio 1/Bestival star Rob da Bank, visitors to the event will enjoy a series of live sets throughout the week. Skipper, Nick Moloney, who boasts a rich and successful sailing career, including 2 America’s Cup campaigns and 12 individual World Sailing Speed Records will be joined on board by three other accomplished British sailors - Andy Walsh (helmsman), Olly Smith (bowman) and Hugh Styles (trimmer). A select handful of guests, will also be offered the unique experience of enjoying the action firsthand, as ‘5th Man’ passenger, alongside the crew. 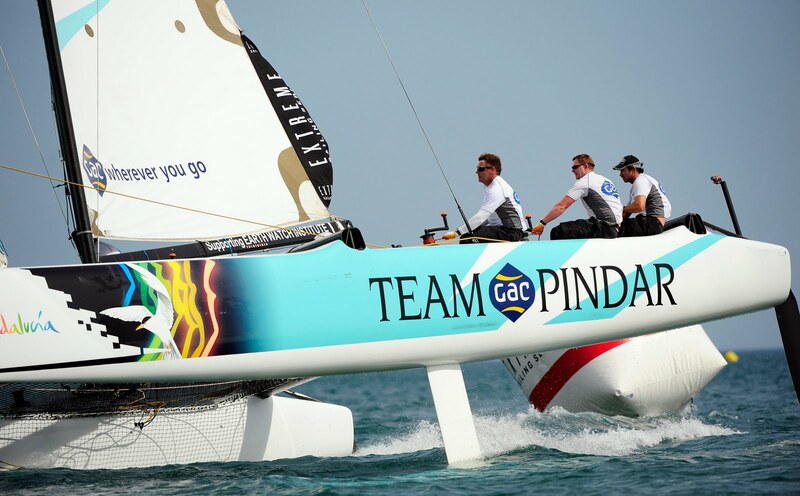 In May, independent sailing company ‘Team Pindar’ joined forces with Dubai-based global logistics provider ‘GAC’, to enter a joint team in this year’s European Extreme Sailing Series. Together, the two brands are seeking to leverage the synergies from their combined strengths and networks to build brand awareness and generate business opportunities in the maritime arena. 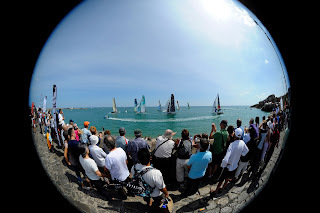 The 2010 Extreme Sailing Series began on May 27 in Sète, France. After Cowes it will visit three other European destinations: Kiel (Germany), Trapani (Italy) and Almeria (Spain). Teams competing alongside Team GAC Pindar in Cowes include current series leaders Groupe Edmond de Rothschild, defending Champions Oman Sail Masirah, Red Bull Extreme Sailing and Ecover Sailing Team. Gitana team winning in Sète. Image copyright Vincent Curutchet/DPPI/OC Events. Two months after their victory in Sète, Yann Guichard and his crew aboard Edmond de Rothschild Group are back on the Isle of Wight to compete in the Extreme Sailing Series circuit for the second event of the season. Act II begins this Saturday 31st July, with the results decided on Thursday 5th August. This year the English stage is introducing some new elements on every front: teams will do battle for six rather than four days of races, in line with the classic Grand Prix format, so as to integrate perfectly into the famous Cowes Week. Such a format will also enable teams to enjoy some more varied race days with a long race in the morning and some small round the cans races in the second half of the afternoon. In short, an even spicier spectacle, to that already witnessed in the South of France at the end of May. Nestled in the South of England, just a few nautical miles from Southampton, the Isle of Wight is the cradle of yachting. It was here in 1851 that the America’s Cup was born. The British members of the Royal Yacht Squadron challenged the Americans to a race around the Isle of Wight for the Universal Exposition of London; the American schooner taking victory. Twenty-five years earlier, in 1826, Cowes Week was created; an annual gathering for thousands of racers, which today ranks as the oldest yacht race in the world. It is within this prestigious context, steeped in history, that the second event in the Extreme Sailing Series 2010 will take place. “Cowes – and the Isle of Wight in general – is an enchanting place, especially given the fact that we’re lucky enough to be sailing during Cowes Week and will be able to mix it up with our high-tech catamarans and the host of other yachts which are as varied as they are prestigious. The hundreds of boats, which race on the waters of the Solent on a daily basis, and the thousands of sailors who join together each evening to chat about the day’s racing, is a unique and really impressive spectacle!” admitted Yann Guichard. Winners of the opening event in Sète at the end of May, Yann Guichard and his crew are eagerly awaited at Cowes, where they rank among the favourites. It’s a label the Gitana skipper and his crew shoulder in a relaxed, albeit determined manner: “In the Extreme Sailing Series every race is specific and winning one event doesn’t systematically imply that you’ll perform well in the next one. We’re highly motivated, keen to sail cleanly and enjoy ourselves on the water. With the first two Grands Prix being relatively far apart, two months separating the two events, it’ll be good to get into the thick of the action again.” Let there be no mistake about it though; the two months which have just elapsed have been far from restful for Yann Guichard and the members of the Gitana Team. Fronting both the Gitana 11 and the Extreme Edmond de Rothschild Group’s sports projects, Baron Benjamin de Rothschild’s team has been putting in a lot of time on the water aboard the 77 foot maxi-trimaran, along with monitoring her fine tuning with a view to the next Route du Rhum. Yann Guichard has been able to link together a series of solo sails offshore, as well as completing the qualifier required by the organisers. 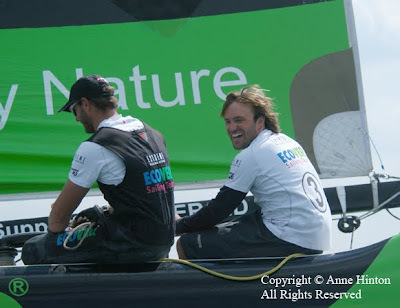 Suffice to say that it’s a well honed sailor who will take the helm of Edmond de Rothschild Group this Saturday. Indeed the sailor from Marseille is a great multihull specialist and was one of the most sought-after crew during the time of the Orma Class Grands prix. From there he went on to the Decision 35 and then the Extreme 40, with a vast array of different experiences on a variety of different hulls. His expertise led him to one of his finest rides of all time back in February, when he became the first French sailor to win the America’s Cup on the water as crew aboard the trimaran BMW Oracle. At that stage Thierry was responsible for trimming the famous rigid wing, of which great reams of text were written, as well as the headsails. 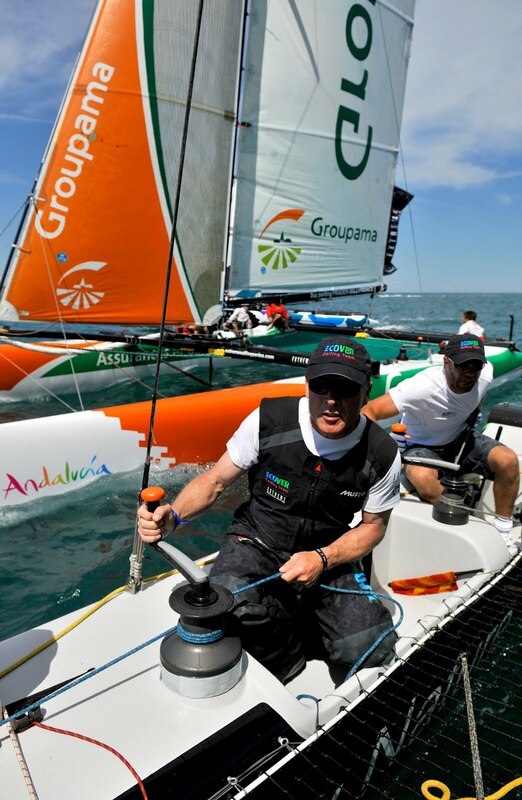 Nicknamed “Fouch”, this talented sailor is a legend in the position the Gitana skipper has entrusted him with! Gitana team racing off Sète. Image copyright Vincent Curutchet/DPPI/OC Events. In Cowes, the catamaran fitted out by Baron Benjamin will do battle with eight teams, among which a total of seven teams were also present in Sète. However, a third French crew will be adding its name to the list, bringing the number of pretenders for victory on English waters to nine: Roland Jourdain, better known for his solo circumnavigations of the globe aboard a monohull, will be at the helm of an Extreme 40 for the first time. 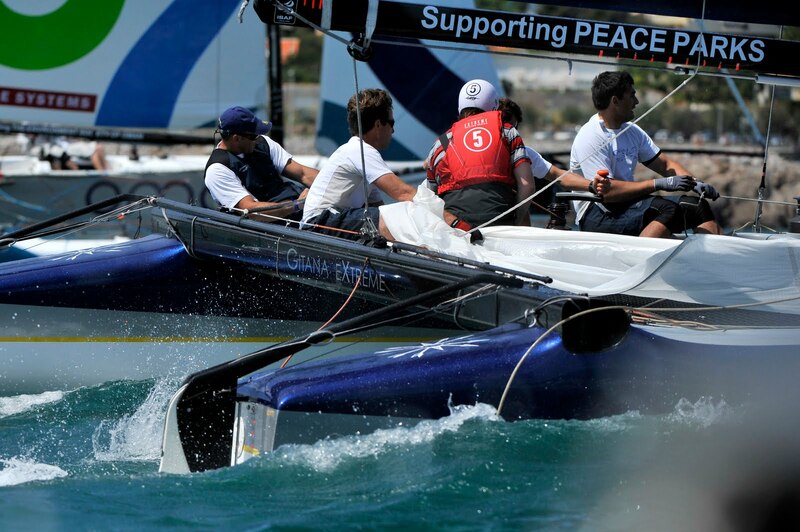 The Extreme Edmond de Rothschild Group is supporting the Peace Parks Foundation. 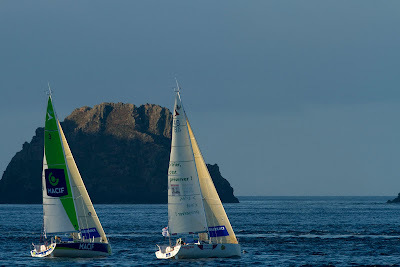 Solitaire du Figaro leaders. Image copyright Courcoux-Marmara/Le Figaro. The 45 Figaro sailors set off from Le Havre in Northern Normandy yesterday on their first leg, 515 miles to the Gijón, in Asturias on the Spanish Cantabrian coastline. Eric Peron (Skipper Macif 2009) grabbed Karine Fauconnier’s (Eric Bompard Cachemir) early lead shortly after the last position poll and has continued over the past twenty four hours to maintain a narrow margin over his immediate pursuers, Erwan Tabarly (Nacarat), Adrien Hardy (Agir Recouvrement), Nicolas Lunven (Generali) Armel le Cléac’h (Brit Air). Sailors who opted for a more inshore course were rewarded with a lead this morning, however as the fleet rounded the Cherbourg headland filing down past and between Guernsey and Sark, the bulk regrouped. The coming twenty-four hours promises to be just as complex as the sailors attempt to get some rest and keep their keel and rudders clear of the seaweed before embarking on the passage at Four and the maritime traffic at Ushant on the turn south into the Bay of Biscay. Eric Peron (Skipper Macif 2009) holds just a tenth of a mile lead over both Erwan Tabarly (Nacarat) and Adrien Hardy (Agir Recouvrement), all of whom opted for a more inshore route under the rhumb line. 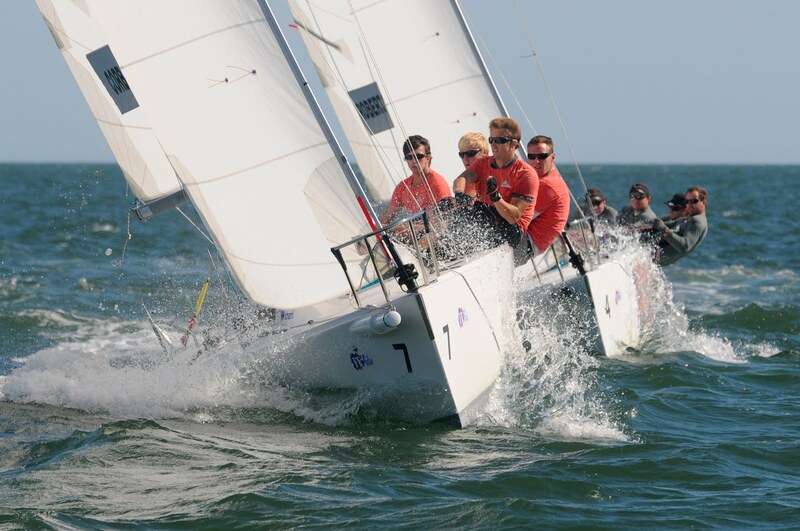 Twenty-nine sailors are within two miles of each other twenty-four hours into racing, proving once more just how high and level the standard of racing is. Each inch of a mile is eked out with effort and concentration. “What is annoying me most is the seaweed, every 5 minutes you have to get into the water to get rid of it” complained 2009 winner, Nicolas Lunven (Generali) over the VHF this morning. Seaweed, windless patches and currents are all impediments to the smooth boat handling that the sailors have to contend with constantly. Keeping up a regular performance whilst attempting to rest and prepare for what looks to be a second complex night at sea constantly eats away at the minds of the solo sailors throughout the day. 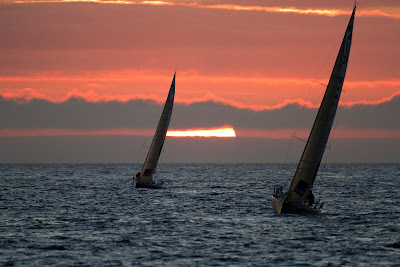 “Although we are sailing comfortably in 10 to 12 knots of westerly breeze, tacking our way up to the point of Brittany, we are likely to have a complex night ahead to get past Ushant and the heavy maritime traffic” reported Race Director, Jacques Caraës from the Race Management boat shadowing the fleet. “Tonight it is going to be tough once more.” Explained Isabelle Joschke (Synergie), lying in 18th place at 16:00 Wednesday, “we are most likely going to get round the Four under spinnaker against the current so we should have much of the same, maybe even tougher than last night”, she concludes. Most agree that there will be choices to be taken and options that open upon rounding the next major point of passage, where the wind is forecast to veer round towards the north, northwest and “decreasing before increasing at the Raz de Sein” predicts Sylvain Mondon from Météo France, “the ridge of high pressure is expected to drift tonight just ahead of the fleet right up to Friday, when they will have to negotiate crossing it on the final approach to Gijón. Early forecast would expect to see the first to finish in Gijón in the early hours of Saturday morning. Anthony Marchand (Espoir Région Bretagne) leads the rookies in 15th place, whilst Jonny Malbon (Artemis) from the UK lies in 20th place well positioned with the leaders. Pietro D’Alì (I.NOVA 3) has managed to catch up on the leaders and currently stands in 27th place and just 1.7 nm from the leader, after having lost ground on the more offshore option last night and Francisco Lobato (Roff / Team-Tempo) has narrowed his gap on the leaders to 7.4 miles bringing up the back of the fleet. 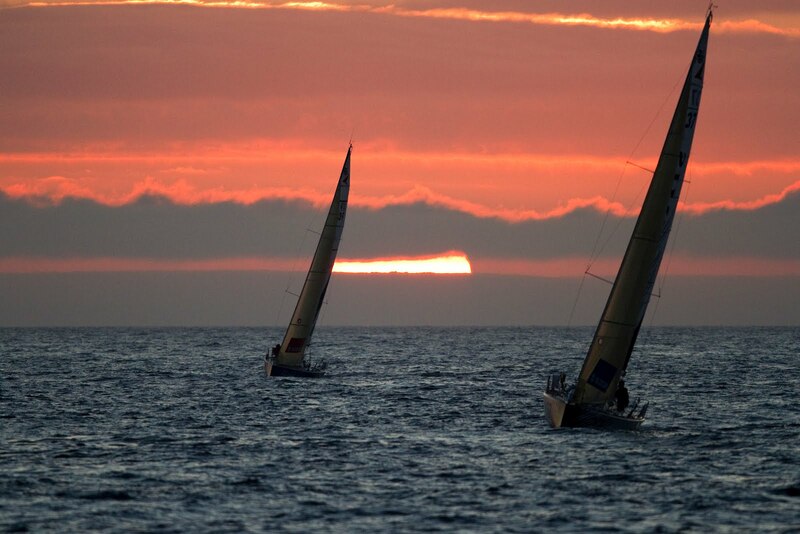 Dawn at sea for the Figaro sailors. Image copyright Courcoux-Marmara/Le Figaro. J80 match racing off Pornichet, France, venue for the Trophée Manu Minard 2010. Supplied image. 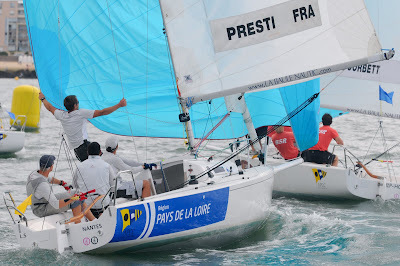 The 9th edition of the French national match racing championships, the Trophée Manu Minard, gets underway 29th July at Pornichet, Brittany, France, with two Kiwi teams competing against top French sailors, Russian, Portugese, Italian and Monacan teams. 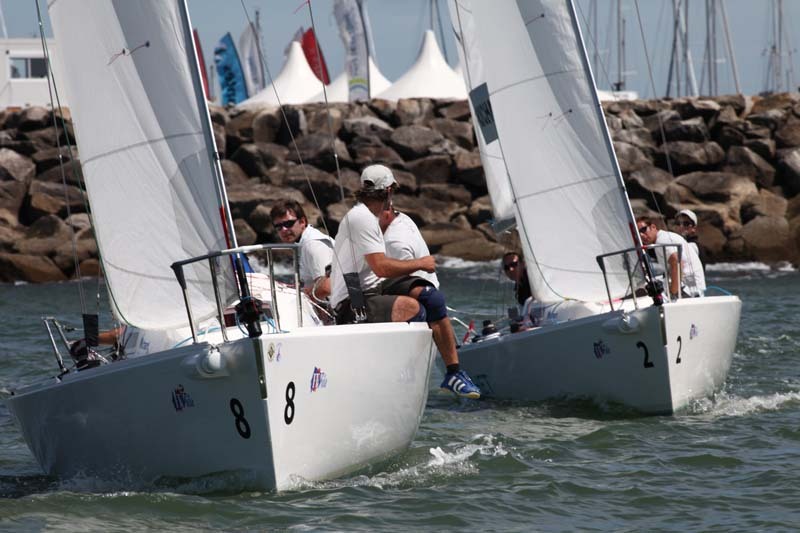 The ISAF Grade One event is a qualifier for the 2011 World Match Racing Tour's event in Marseille, on the Mediterranean coast of France. The APCC Voile Sportive, the club in the metropolitan area Nantes Saint-Nazaire, is the event organiser, and racing will be held in J80s. The 2009 winner, Seb Col, of the French/German ALL4ONE team, will not be back to defend his title. However, France's top ranked match racer, Mathieu Richard, currently 3rd in ISAF's open match race rankings, and World Match Racing Tour leader 2010, heads the entry list. Other top French racers include Damien Iehl (10th on ISAF match race ranking list), Pierre-Antoine Morvan (13th) and Philippe Presti (14th). Synergy youth team's Eugeniy Neugodnikov (RUS), currently ranked 8th for match racing by ISAF, is also taking part. Close match racing in the 2009 edition of the Trophée Manu Minard, won by Seb Col. Supplied image. 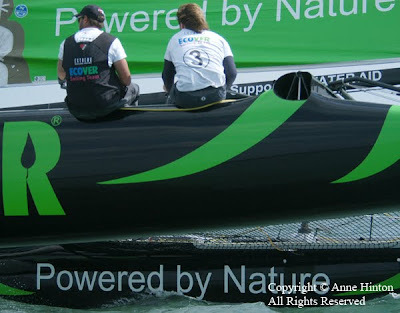 The New Zealand teams competing are Black Sheep Racing, skippered by Reuben Corbett, and Waka Racing, skippered by Phil Robertson. 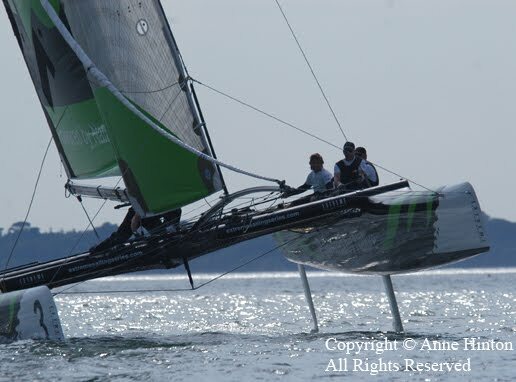 Black Sheep Racing have been storming up the ranking list, winning Grade 3 events in Estonia and France (La Rochelle), a Grade 1 in Russia and narrowly losing out on a quarter-final spot in their first appearance on the World Match Racing Tour at Stena Match Cup Sweden earlier this month. Corbett defeated both Iehl and Neugodnikov on his way to victory in Russia, and is currently ranked 25th by ISAF. He has been training for this event against Pierre-Antoine Morvan in Lorient. Robertson has been on the international match race circuit a little longer than Corbett, and is currently ranked 21st by ISAF. He recently lost out to Neugodnikov in the finals of a hard fought Grade 3 event in Slovenia. The Waka Racing crew have been sailing with Magnus Holmberg, who defeated Corbett in the deciding match as to who went through to the quarterfinals of Stena Match Cup Sweden this year. They went through the regatta in Sweden to finish third. The race director is former top French match racer Luc Pillot. The umpire team will be led this year by Marianne Middelthon (NOR), assisted by Jean-Pierre Cordonnier (FRA) and will be composed of French umpires Christophe Schenfeigel, Gérard Bosse (Umpire International and America's Cup umpire), Marc Bouet (French match racing coach), and, from abroad, Bill O’Hara (IRL), Antonio Otero (ESP), Pekka Nuutilainen (FIN) and Zvonko Hocevar (SLO). The winner of the 2010 Internationaux de France de Match Racing will be awarded the Trophée Manu Minard, on conclusion of the competition on Sunday, 1st August, CET.